In the wake of the loss, La Valette was desperate to sustain the fort’s morale; with this in mind he appointed Miranda as de facto commander of Saint Elmo. The Spaniard was not an aristocratic knight, but an experienced and practical field commander who understood his men. It was not the consolations of religion that would stiffen their resolve but tangible rewards. He asked for money, “for nothing pleases soldiers more than money,” and barrels of wine. He paid the men and set up gaming tables and a bar in the covered arcades around the parade ground. In the short run it was effective. The Ottomans, however, felt that the end must be near. They kept raising the ravelin to overtop the fort and peppered the interior with shot. The men worked furiously to fill up the ditch with brushwood, earth, and bales of wood. At the same time, the Ottomans hauled up masts from some of the galleys and constructed a scaffolding bridge across the ditch and adjacent to the ravelin, from which the workers were protected by arquebusiers: any defender who showed his head above the parapet was immediately shot down. A second bridge was built farther down the wall. The bridge building, however, provoked a furious response: a sortie was mounted to burn the first bridge with only partial success—and “by Vespers they had repaired it again.” Bridge work continued: a causeway was laid, wide enough for five men to walk abreast, and covered with earth to proof it against incendiaries. The defenders were compelled to crouch beneath the parapet, so that it was impossible to hinder this operation; the whole fortress was being probed by gunfire so that “there was not a safe place in St Elmo.” Seeing the hopelessness of their situation and the likelihood of another assault, morale in the fortress snapped again. The whole body of men, including the Knights of Saint John and Captain Miranda, agreed to dispatch another captain, Medrano, to Birgu to put the case to La Valette and his council. It was a unified response. Medrano declared that the fort could not be held much longer; “because their defences had been levelled, the enemy’s bridge was nearly completed, and that, owing to the height of the ravelin, which commanded the whole fort, whence the Turks were bombarding them, it was not possible to defend themselves.” La Valette somehow persuaded the concerned Spaniard to return to the fort with vaguely reassuring words, but they failed to assuage the growing panic inside. While the bridge building continued apace, the chink of pickaxes working at the foot of walls convinced the garrison that the Turks were about to plant mines. Meanwhile the bombardment went on night and day without stopping, “so that it seemed as though they wanted to reduce the fort to dust.” It was clear an all-out assault was near. On June 8 the council on Birgu received a second letter from Saint Elmo: the end was nigh, they were expecting to be blown sky high at any moment, they had withdrawn to the church in the center of the fort and would prefer to sally out and die straightaway. This letter was signed by fifty knights. La Valette’s response was again to play for time: he sent across another commission. When the three knights arrived, they found the fort in uproar. The defenders’ nerves were in shreds. Panicky preparations were being made to abandon the fort; cannonballs and trenching equipment were being thrown down wells; work was in hand to blow up the fort from within. When the commissioners declared that Saint Elmo was still defensible—and that it was impossible to mine a fortress built on solid rock—rage boiled over. An open mutiny erupted in the parade ground; they taunted the commissioners to show them exactly how the fort could be held. The gates were closed to detain the visitors inside. Only when someone had the wit to sound the alarm bell did the men disperse back to their posts, and the commissioners slipped back across the water. On Birgu the council met to discuss the matter; the rebellious garrison dispatched a swimmer across the harbor in quick time to reiterate their fears. 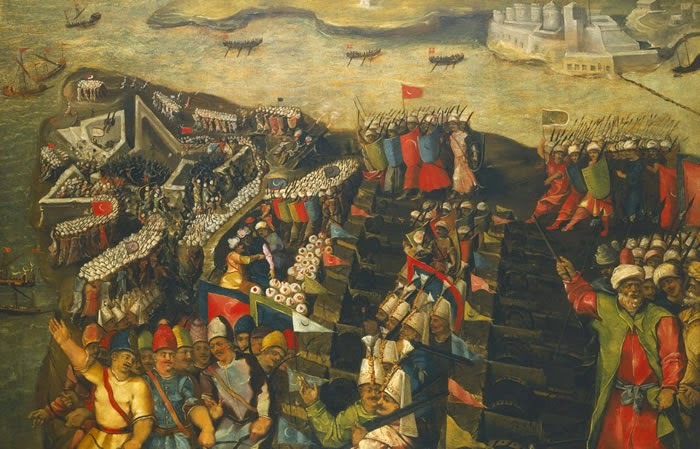 In camera, the council was deeply undecided about how to proceed; some wanted withdrawal to preserve the men, others were for holding out, but in practice there was no choice; it would be impossible safely to evacuate such a large body of men now that the harbor was monitored by Ottoman guns. The defenders had to be persuaded to go on buying time. A combination of promises and blackmail eventually quelled the mutiny. Don Constantino, one of the knights’ commissioners, offered to raise volunteers to go to Saint Elmo. In Birgu’s main square drums summoned recruits to the standard. The council then calmly informed the mutineers at Saint Elmo that they could return if they wished: “For every one who came back, there were four begging and imploring to take their place.” Meanwhile La Valette wrote to the knights in the fort, reminding them of their vows to Christ and their Order. A new commander was appointed, Melchior de Monserrat; there was an upsurge of zeal; the Christians were impressed that two converted Jews volunteered for the cause, and the inspirational preacher Robert of Eboli went across. Captain Miranda made a stirring speech to the men “in the language that soldiers understand” to the effect that “they should fight bravely and sell their lives to the barbarians as dearly as possible.” A second swimmer came back from the fort, announcing that “all said with one voice they did not wish to leave the fort, but that reinforcements and munitions should be sent to them; that they all wished to die in St Elmo.” The nightly transfusions of men and materials continued; a hundred men were ferried over with a great number of banners to plant on the ramparts to give the impression of a large relief force. There was no more talk of dissent. The battle that raged day after day over the small fort was being conducted with all the evolving weapons of the age of gunpowder. The Ottomans certainly had—and used—deadly companies of archers, but it was the sound of explosions echoing around the stricken fort that gave the impression of Armageddon. From a distance it was a conflict of sniper fire and artillery bombardment; a man could be smartly felled by a single bullet or dismembered by an iron ball, but in the close-quarters struggle for the walls, an ingenious range of small-scale incendiary devices came into play. The Christians had primitive hand grenades and flamethrowers, pots of Greek fire and barrels of pitch, as well as swivel guns and heavier arquebuses that fired stones the size of pigeons’ eggs and chain shot for slaughtering close-packed charging men. The Ottomans responded in kind with bursting grenades that hurled clinging fire at the heavily armored defenders. All these weapons were crude, experimental, and unstable. The risks in using them were considerable. Accounts of the siege ring with the accidental deaths of the weapons’ handlers: barrels of gunpowder exploded; grenades ignited the stock around them before they could be thrown; men were regularly maimed and burned to death by their own weapons. When these weapons worked, they could be devastating. In this laboratory of flame warfare, the Christians decided to test a new device. On June 10, La Valette sent over a stock of fire hoops, an innovation said to have been invented by the knight Ramon Fortuyn. “These consisted of barrel hoops well covered with caulking tow and well steeped in a cauldron of boiling tar. They were again covered with tow and once more immersed in tar. This process was repeated until they became as thick as a man’s leg.” The aim was to hurl them over the parapet into a mass of charging men. They were soon pressed into service. On that day the Ottomans launched another fierce attack; the janissaries in their loose robes poured over the bridges and set ladders to the walls. As the charging, scrabbling men pressed forward, torches were set to the hoops; they were levered over the parapet with iron tongs and set bouncing and spinning down the slope like demented circles of fire. The effect was devastating. The clothes of two or three soldiers at a time would get entrapped by the giant wheels. Balls of flame now, the men would turn and run, robes and turbans alight, scattering terror and fire in their wake as they headed for the sea. The psychological impact of the wheels was profound. The janissaries pulled back, but only for a while. Mustapha was determined to finish off the fort. After dark the men came again. The whole sky was illuminated by the flash of cannon and the flare of incendiaries—fire hoops, flamethrowers, and pots of Greek fire rained over the walls; the onrushing Muslims hurled back exploding fire grenades that burst on the parapets and illuminated the defenders in an incredible and ghastly light. There was no darkness; from across the water Saint Elmo looked like a volcano of fire. It was bright enough for the gunners on Birgu, trying to disrupt the Turks with cross fire, to prepare their guns without torches. The screams and shouts, the explosions and the violence of the light, convinced the grand master that Saint Elmo had fallen. Yet somehow it held. Again the Turks drew back. By now it was dawn; the early sun was rising; the defenders were exhausted, dead on their feet, and Mustapha knew it. He called for one more frenzied attack. Fresh men surged forward again with ropes and grappling hooks, which they attached to the barrels of earth and makeshift barricades on the parapets that screened the defenders from rifle fire. Hauling themselves up, they managed to establish a position on top and plant their flags. Sensing the danger, the commander of the bastion, Colonel Mas, loaded a light gun and blasted the janissaries off the wall with a enormous crash “and hurled them into the ditch again, with great terror to the others.” The attack collapsed. The Turks withdrew with great losses. Silence fell over the battlefield. The Muslims spent the day collecting and burying their dead in mass graves. But the defenders were also hemorrhaging men at an unacceptable rate. La Valette ferried across another one hundred fifty men together with ammunition and “baskets, mattresses and unravelled rope” for building barricades. The four-day siege was now in its fourteenth day. Bad news was starting to leak out of the Ottoman camp. Christian deserters and captured Turks drip-fed encouraging scraps of information about the assault on Saint Elmo to La Valette and the army council in Birgu. Ottoman losses the previous night had been considerable; many seasoned troops had been killed. There was disease in the camp and the wounded were dying; rationing had been instituted—laborers were limited to ten ounces of biscuits a day. There was ill will between the pashas and the janissaries: “The pashas were reproaching the janissaries for calling themselves the Sons of the Sultan and for their many other brave boasts, yet still they had not got the spirit to take a small, weak and ruined fort, against which a bridge had already been laid.” At the same time an atmosphere of intense competition between Mustapha and Piyale, between the army and the navy, was further straining the morale of the camp. Two opposing forces propelled Mustapha forward: the fear of disgrace and a desire for glory. Whispers reached the pashas that Don Garcia was gathering ships and men in Sicily; Piyale dispatched a fleet of galleys daily to patrol the Malta channel. However, if morale inside Saint Elmo had been raised, it was by no means rock solid; and on June 13, Mustapha received information that seemed to promise a final solution. An Italian soldier, no doubt reckoning that the end was nigh, slipped over the walls and presented himself in the Ottoman camp. He told Mustapha to raise the ravelin even higher, to prevent any movement around the fort and to cut off all relief from Birgu. One last assault would then finish off the few remaining men. The following day the defenders could hear a voice calling to them in Italian. Mustapha was making them an offer, “on the promise of his head.” The pasha would give them free passage out of the fort to wherever they wanted to go. The alternative was a horrible death. The voice was promptly answered by a volley of arquebus fire and a succession of spinning fire hoops. The defenders were resolved to fight to the last. They prepared themselves for one more attack. Mustapha began what he hoped would be the final preparations with the time-honored Ottoman tactics: continuous bombardment day and night, skirmishes, localized attacks, and innumerable false alarms—all designed to leave the defenders sleepless and exhausted ahead of the last push. Labor corps worked incessantly, trying to fill in the ditches with earth and bundles of brushwood, while arquebus fire rattled the parapets. The defenders hampered these attempts as best they could. They set fire to the brushwood and shot dead the brilliantly attired aga (commander) of the janissaries, which caused great disturbance in the Ottoman camp. The night of June 15 saw another thumping artillery barrage under a bright moon. Then silence.